To select high quality candidates with the ability to succeed at tertiary study in Australia, with minimal extensions and with the abiliity contribute to Indonesia's development. Australian Development Scholarships (ADS) are funded by the Government of Australia for postgraduate study at Australian universities. The main goal of ADS is to promote Indonesia's human resource capacity to contribute to four areas of development priority:Sustainable Growth and Economic Management; Investing in People; Democracy, Justice and Good Governance; and Safety and Peace. Selection ProcessAll applicants are considered by an independent Joint Selection Committee comprised of Australian and Indonesian academics. Only those shortlisted will be interviewed. The interview will assess candidates’ academic ability, clarity of study goals, cultural adaptability. A critical consideration will be how well the ADS applicant is able to explain the relevance of their proposed study area to the development of Indonesia. The interview will be accompanied by an IELTS test of English language proficiency. Final selection is objective and based on the principles of merit and equity. Notification Of The Selection ResultAll applicants will be advised whether or not they have been shortlisted for an interview. All interviewed applicants will be notified whether or not they have been awarded an ADS. The agencies of Public sector nominees will also be notified. The result is final and no correspondence will be entered into. Notification will include details of pre-departure training (English, academic skills, cultural preparation). This training is compulsory and full-time. Your scholarship is provided by the Australian Government as part of Australia’s program of development cooperation with Indonesia. The Australian Agency for International Development (AusAID) is the agency responsible for the Overseas Aid program of the Australian Government. 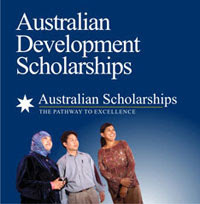 The Australian Development Scholarships (ADS) is part of AusAID’s commitment to human resource development in Indonesia. AusAID has contracted IDP Education Pty Ltd to administer and manage your scholarship. IDP has formed the ADS Project Office to carry out this task.